The Long Island Ducks defeated the York Revolution 5-2 on Wednesday night in the middle game of a three-game series at Santander Stadium. In addition, the Ducks clinched a berth in the 2015 Atlantic League playoffs when the Somerset Patriots topped the Bridgeport Bluefish 6-2 in Connecticut. Long Island jumped out to a 2-0 lead with single runs in the second and third innings against Revolution starter Matt Neil. A two-out RBI double to left field by Cody Puckett and a sacrifice fly to right off the bat of Randy Ruiz did the damage. It stayed that way until the fifth when Andres Perez delivered a two-out, two-run double to left off of Ducks starter Bruce Kern, tying the game at two. The score remained even until the top of the ninth when the Ducks rallied for three runs to take a 5-2 advantage. Anthony Vega’s RBI single, a run-scoring groundout from Dan Lyons and a RBI single by Lew Ford highlighted the inning. Neither starter factored into the decision. Kern yielded two runs on four hits and three walks with seven strikeouts in four and two-thirds innings. Neil gave up two unearned runs on five hits and one walk in seven innings while striking out four. Ryan Kussmaul (5-2) earned the win, pitching a scoreless eighth inning and striking out two. Stephen Penney (4-6) took the loss, surrendering three runs on four hits in one inning of work. Amalio Diaz collected his 14th save with a scoreless ninth, striking out the side. Puckett, Vega and Fehlandt Lentini each had two hits to pace the Flock. 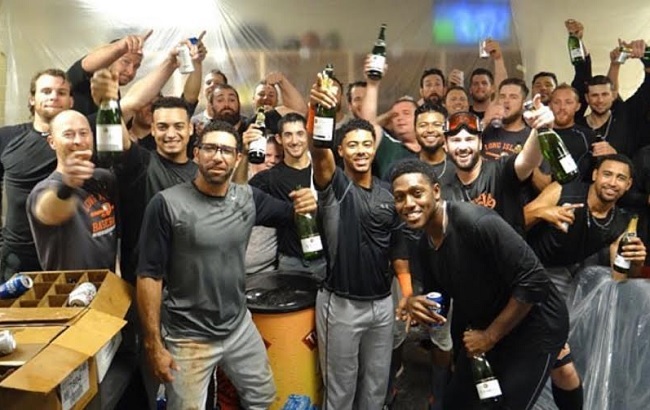 With their 10th playoff berth in the last 12 seasons now secured, the Ducks will host Games One and Two of the best-of-five Liberty Division Championship Series against the Somerset Patriots on Wednesday, September 23 and Thursday, September 24. Game time for both contests is 6:35 p.m.Should they advance, the Ducks would host Games One and Two of the best-of-five Atlantic League Championship Series on Wednesday, September 30 and Thursday, October 1. Both of those contests are also slated to begin at 6:35 p.m. Tickets to each playoff game are available by visiting the Bethpage Ballpark box office, calling (631) 940-TIXX or CLICKING HERE. Long Island and York wrap up their three-game set on Wednesday night. Game time is slated for 6:30 p.m. from Santander Stadium. Left-hander Joe Bircher toes the rubber for the Ducks against Revolution southpaw Rommie Lewis. Fans can follow all of the action live on the Ducks’ official YouTube channel. Streaming audio will be available online byCLICKING HERE.